In 1983, Woody Allen made a fake documentary called Zelig, a film based on the joke idea that a human chameleon (whom no-one had ever heard of) had actually been present at every significant event in the history of the 20th century. Raymond Scott (1908- 1994) is not a household name either, but he does possess something of that same Zelig-like omnipresence, once you start looking for him. In 2008, Cory Doctorow of the Boing Boing site cited Scott as ‘hands-down my favorite composer. He was also a brilliant engineer whose homebrew, pre-digital sampling and sequencing techniques were 60 years ahead of their time.’ Peter Buck of REM, Henry Rollins, and Andy Partridge of XTC have all praised Scott’s pioneering genius in similar fashion. 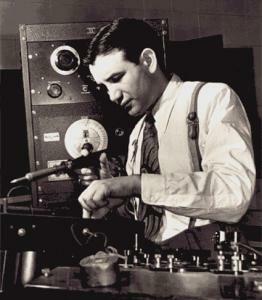 Much of Scott’s influence has stemmed from the trailblazing electronic music laboratory that he had set up in the mid 1940s, called Manhattan Research. As this Wikipedia article explains, some of what emerged from the Manhattan Research lab anticipated developments in modern classical music as well as in electronica. 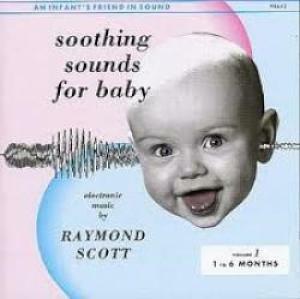 Scott used his own invention – the Clavivox – to compose several early electronic music pieces in the 1960’s including three volumes of synthesised lullabys called “Soothing Sounds for Baby” (1963) predating minimalist music’s use of repetition [Philip Glass, Terry Riley, John Adams, Steve Reich etc] by several years. Scott and his technicians had devoted themselves to the development of purpose built electronic instruments such as the Clavivox (which was a kind of Theremin with a keyboard) and a huge device called the Economium. Bizarrely, Scott came to the attention of Motown Records magnate Berry Gordy Jnr, who signed him to Motown – and for several years, the Economium was kept at Gordy’s house, at least until Gordy finally lost interest in Scott’s never-ending experimentations. The instrument eventually found its way into the hands of Mark Mothersbaugh of Devo, another Scott acolyte. and this one as well? . Rather than attempt to explain Scott’s accomplishment, the music can be left to speak for itself. For starters, here are a couple of examples from Scott’s early exotica and cartoon days. ‘Siberian Sleigh Ride’ is from one of the hallucinatory Betty Boop cartoons made by the Fleischer Brothers cartoon studio. On the other hand, the “Twilight in Turkey” sequence comes from a 1937 movie called Ali Baba Goes to Town. The plot of the film sounds like something you’d expect from Preston Sturges – it was about a hobo who walks onto a film set, falls asleep and dreams he’s back in old Araby as a courtier of the Sultan. Allegedly, the film was meant to be a satire of Franklin’s Roosevelt’s New Deal, since the hobo organizes work programs, taxes the rich and abolishes the army, no less. In this sequence, the enthusiastic drummer is Johnny Williams, whose son later became the major Hollywood composer, John Williams. The next few tracks offer a couple of examples of Scott’s electronic work. “The Happy Whistler” comes from those Soothing Sounds for Baby albums that were the forerunners to minimalism, while the 1963 work “Little Miss Echo” is extraordinary in its own right – especially given the difficulty of creating these sounds with the technology of the day. Regardless, “Little Miss Echo” still sounds as modern as anything emerging from bands like Boards of Canada or Ducktails. Finally, I’ve picked three examples from Scott’s corporate/industrial work. The fantastic 5 minute long Paperwork Explosion short film was made in 1967 to extol the virtues of IBM, and Scott’s collaborator here was Jim Henson, during his pre-Muppet days. Somehow, the fact that IBM – thinly disguised as the name of the programming language Cobol – appeared as the evil corporation in the Leonardo DiCaprio film Inception only adds to the strange, parallel universe feeling of this clip. I’ve also chosen pieces from the Manhattan Research lab period, namely ‘Lightworks’ and a modern reworking of ‘Bendix: The Tomorrow People’. The late, much lamented hip hop producer J Dilla used samples from them on the “Lightworks” track that opens his posthumous masterpiece, Donuts. You get the feeling that given the chance, Scott would have swapped the praise for a research grant to get back into the workshop – in order to try and turn that vision of the future into a tangible reality.